In the parable of the Rich Man and Lazarus, the Rich Man walked by poor Lazarus every day. The Rich Man didn’t hate Lazarus – he just ignored him, committing the sin of indifference. The opposite of love is not hate. The opposite of love is indifference. We have been blessed with great treasures of the faith and Lazarus lies at our gate. Lazarus is the visitor that walks through the doors of our church on Sunday morning. Lazarus is the lapsed Orthodox Christian visiting the parish after a long absence. Like the Rich Man in the parable, we often walk right by without noticing, and they eat from the crumbs that fall from our table. If we believe that in Orthodoxy we have the fullness of the Truth, then we have the great responsibility – the Great Commission – to share it with everyone. As Jesus said, “Go therefore and make disciples of ALL nations –ΕΙΣ ΠΑΝΤΑ ΤΑ ΕΘΝΗ! For non-Orthodox as well as for inactive Orthodox Christians, entering an Orthodox church can be a very uncomfortable, intimidating experience. Often the first person our visitors see is a member of the parish council. Reaching out to those who enter our doors with a handshake, a greeting and a welcoming smile could be the most important missionary work we do. Simply put — friendliness has eternal implications. Unless people see in us the light and the love of Christ, they will not believe. The Priest is head of the Parish, and is charged with the guidance of the total Parish program. The parish council consists of the Priest, and the elected lay members, and is referred to as a board only when so required by local statute. In internal matters of the Church, we always use the designation of Parish Council. 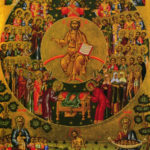 This is because one of the identifying traits of the Orthodox Church is that we are conciliar – decisions are made in council. In the Oath of Office, the parish council members affirm that they “…will fulfill faithfully and sincerely the duties and obligations required of a member of the Parish Council….” A promise is made which rests on the shared commitment of all council members to serve the Church, which is the Body of Christ on earth. We are His hands, feet, eyes and more. To serve on the council is a ministry and a mission. We are called to use the gifts with which we have been blessed to carry out the work of the Church.